I'm very excited to introduce our first Warm and Cosy New Voices entry today. Marcy Bassett-Kennedy's entry went live on September 26. Congrats, Marcy! Tara Reilly is determined to be made a partner in her father's real estate development firm. Ecologist Carter Donovan is leading the protest against the most important project of Tara's career. Can she get him on her side without losing her heart? Today, we have another Contemporary Romance addition to New Voices The Wall of Fame with Kerrin Hearfield hitting the submit button on September 22. Congrats, Kerrin! Emma McCarthy is sick of denying how she feels for Matt. So she proposes. But in doing so, by acknowledging their one kiss and demanding he give up his past, will she lose her best friend? I'm at the Minxes of Romance blog today, talking about how to conquer the crows of doubt that often circle our writing. You can find my post on how to beat that negative voice for the Mills & Boon's New Voices competition here. 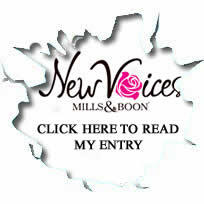 Labels: Mills and Boon New Voices Competition 2011; beat that negative voice, positive thinking. It’s only the second day since the launch of the Mills & Boon New Voices Competition for 2011 and we already have not one but THREE entrants on The New Voices Wall of Fame. Blake Hargreaves is an Army Doctor who was seriously injured overseas. Now he's home and trying to come to terms with both the physical and mental scars. The last thing he needs is to be house sharing with flighty, too attractive Sienna Andrews. Katie Allerton turned her back on the fairy tale to live life on her own terms. Michael Kelly is the classic Prince Charming, and not at all what she wants. But Fate doesn’t care what she wants, for every Princess must have her Prince. When Hannah inadvertently rescues vigilante Christian, she has no clue what she's getting herself into. At first he seems like the answer to all her problems, but she soon discovers his dark good looks and winning charm mask a troubled heart. Loads of luck to the entrants and to everyone else... happy writing! There’s only few days left until the launch of the 2011 Mills & Boon New Voices Competition and I’m thrilled to have my internet connection back just in time. Today, I’m unveiling the New Voices blog badges for 2011. These badges can link your blog directly to your entry to help people find your chapter. You can find them at the bottom of this post along with instructions on how save and insert them into your blog and what to do if they won't centre or fit in your sidebar. If you have any trouble, please let me know in the comments because I'm happy to help. From September 13th the New Voices Wall of Fame will be back and YOU can be on it. The Wall is a great way celebrate hitting that submit button and you shouldn't underestimate that achievement. Public forums are a scary business and it takes a lot of guts to enter, so i hope you've got a mini bottle of champagne on standby. The Wall will help people find your entry and last year we formed a mini support group and there were a lot of helpful and encouraging comments left by members of The Wall at other members entries. So, if you'd like to be on The Wall just leave a comment with your name and the name of your New Voices entry (so I can find it and link it). Plus, this year you’ll also get a shout out on Twitter. I’m looking forward to reading your entries and I hope you enjoy the blog badges! 3.Select the file where you want to save the image. 1.Go to your New Voices entry and copy its address. You can paste this into a Word document for safe keeping if you wish. 2.Sign into your Blogspot account. 6.The‘From Your Computer’ option should automatically be selected, if not, select it. 7.Click‘Browse’ and find the saved blog badge image. 9.Paste the address of your New Voices entry into the Link box. 10. Click ‘Save’ and you’re done! 2. Sign into your Blogspot account. 6. The ‘From Your Computer’ option should automatically be selected, if not, select it. 7. Click ‘Browse’ and find the saved blog badge image. 9. Paste the address of your New Voices entry into the Link box. 1. The image has a width of 200 pixels to fit the average sidebar. Yours may be larger or smaller. If this is the case you need to adjust the size of the image in a graphics program. This can be a program as basic as paint (which can be found on any Windows computer in the Accessories folder on the Start bar so no downloads are necessary to do this). 2. First you need to know the width of your sidebar. If you do go to step . 3. To find the width of your sidebar sign into your blogspot. 5. Click on the ‘Edit HTML’ beneath your current blog template. 6. You will then get some scary message about only advance users being allowed to play with html but since you won’t be making any changes you don’t need to worry. Click ‘Proceed’. 8. Make a note of the width. In the example it’s 200px. 10. Open your saved blog badge. 11. Click ‘Resize’ on the toolbar. 13. Where it says ‘Width’ type in the width of your sidebar. 14. Save the image and you’re done! 15. If you’re still having trouble and curse all electronics the world over, feel free to leave me the address of your blog and a way of contacting you in a comment (or email me directly) and I’ll send the modified image along.